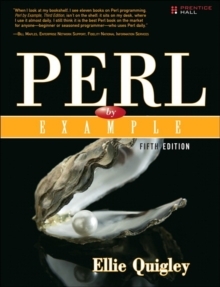 The world's #1 shell programming book-now fully updated for Linux and more!UNIX Shells by Example is the world's #1 shell programming book, from the world's #1 shell programming instructor: Ellie Quigley. In UNIX Shells by Example, Fourth Edition, Quigley has thoroughly updated her classic and delivers the information today's shell programmers need most-including comprehensive coverage of Linux shell programming with bash!Drawing on 20 years' experience as a shell programming instructor, Quigley guides you through every facet of programming all leading UNIX/Linux shells: bourne, bash, korn, C, and tcsh. 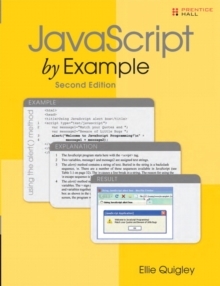 Quigley illuminates each concept with up-to-date, classroom-tested code examples designed to help you jump-start your own projects. She also systematically introduces awk, sed, and grep for both UNIX and GNU/Linux . . . making this the only shell programming book you'll ever need!New in this edition: Comprehensive coverage of Linux shell programming with bash Shell Programming QuickStart: makes first-time shell programmers productive in just 15 pages Complete, practical debugging chapter Updated coverage of the latest UNIX and GNU/Linux versions of awk, sed, and grep Shell programming for sysadmins: walks you through key UNIX and Linux system shell scripts Completely updated: Shell programming fundamentals: what shells are, what they do, how they work Choosing the right shell for any application Nearly 50,000 UNIX/Linux sysadmins, developers, and power users have used previous editions of UNIX Shells by Example to become expert shell programmers. 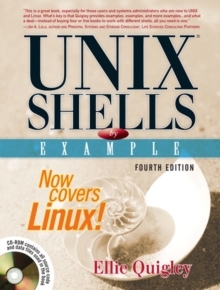 With UNIX Shells by Example, Fourth Edition, you can, too-even if you're completely new to shell programming. Then, once you're an expert, you'll turn to this book constantly as the best source for reliable answers, solutions, and code. 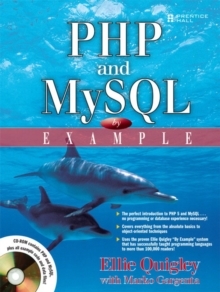 About the CD-ROM Comprehensive shell programming code library: all source code and data files for this book's hundreds of example programs.